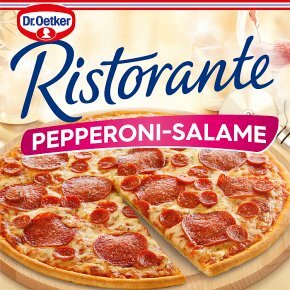 Frozen pizza richly topped with mozzarella & Edam cheese and pepperoni-salami on a thin and crispy base. From Freezer to Plate in 13 minutes. Fall back in love with pizza with the Nation's Favourite Thin & Crispy Pizza. No hydrogenated fats or artificial colours. From freezer to plate in under 15 minutes - just enough time to pour the wine, fix the salad and set the mood: Make it the perfect Mid-Week meal with Ristorante - whether it's date night or a quick meal for the family. Fall back in love with pizza with the help of our Thin & Crispy Ristorante Pepperoni-Salame Pizza; topped with a delicious helping mozzarella & Edam cheese, pepperoni-salami and our signature pizzeria style sauce - because sometimes a delicious classic is the perfect choice. Treat yourself this week, or store in the freezer for an impromptu night-in with friends. Three simple steps to perfect Pizza...1 Preheat your oven. Keep pizza frozen until oven is up to temperature.2 Remove all outer packaging.3 Place frozen pizza directly onto the bottom wire oven shelf. Rotate pizza halfway through cooking.Conventional 220°C, 425°F 10-13minsFan 200°C 10-13minsGas mark 6 10-13minsCaution topping will be extremely hot!